It Take to Build a Sukkah? I made a promise to my good friend, the campus Jewish chaplain and director of Chabad in Waterloo, Rabbi Moishy Goldman. I had no idea what it would entail. 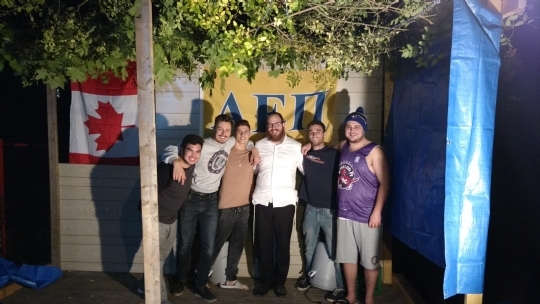 It was a promise that this October, for the first time in our history, the brothers and pledges of the Kappa Omega chapter of the AEPi fraternity would build a sukkah in the backyard of our frat house. Something that would revitalize a wavering sense of Jewish identity amongst our large brotherhood. I remember telling Moishy — also an official brother — the idea after a Shabbat dinner one Friday night with a stomach full of his wife’s carrot cake. The moment I told him, Moishy looked at me with glowing pride as he tousled his beard in thought, contemplating the dimensions of the wall paneling, the required screw sizes, vegetation options for the roofing, and the tedious construction that could only be accomplished with the right help. After all, the sukkah would have to accommodate close to fifty brothers — we weren’t talking about an outhouse shack. This was a big project. An encouraging thought was that this structure would be adjoining a fraternity house; some crooked plywood and spontaneous creativity were both suitable ingredients for the recipe of our makeshift success. We settled on an eight by eight paneling concept and agreed that I would pick up all the necessities at Home Depot on the day of construction. Now I just needed to rally up the troops. We had Reading Week before Sukkot, and most of the guys wouldn’t be back until Monday or Tuesday. With work prohibited during the first two days of the holiday, we had no choice but to aim for the Wednesday evening, with hopes that not too many schedules conflicted. On Monday afternoon, I clutched my phone in rising frustration as I was suddenly told by the president and vice-president, my brothers in need, that their own presence would not be available. Three midterms and a couple essays were about to spoil the plan. I couldn’t blame them; school coming first is a key understanding within our chapter. But without the support of the president and vice-president, the operation would become a little more challenging. In fact, there were no brothers that had even confirmed their availability for Wednesday night. At this point, the stress kicked in full-throttle. I pocketed my phone and walked to class uncertain of what to do. There was no way I’d be able to build a sukkah for fifty brothers myself. What would I tell Moishy? A true test of brotherhood was in order. As Pledge Master, I assigned an official ‘pledge mission’ for any pledges that wouldn’t be vacuumed by the suction of exams and essays. Two guys stepped forward. Perfect. Three guys who had never used power tools were ready to take matters into our unhandy hands. Wednesday I picked up the wall paneling and screws at Home Depot. After power-sawing the plywood with the right measurements, the two pledges and I loaded the truck and headed to the house. Construction commenced as the sky turned dark — nothing but the orange glow of the flood lights illuminated the backyard. A third pledge ended up being able to help too; he got to the house as we started laying out the plywood and discussing the structure of the frame. Three guys had suddenly turned to four. The momentum was building. Surely, we faced a couple more challenges. The bit piece for the power drill became too worn down to clench the screws, so a 10:30 PM trip to Home Depot was required. The oak wood was tough as stone, at first stubbornly refusing our Phillips screws despite the driving force of the drill. We also didn’t have anything prepared for roofing. After we got back from the late night trip, a few brothers who were watching the Leafs game decided to help out. We sang, we laughed, and we indulged in the thrill of power tools. I’d like to officially apologize to our neighbors, and graciously thank them for holding back on any noise complaints. Next thing I knew, four brothers became twelve. Some guys were measuring the placement of the screws, some were angling the plywood and some would drill away. It was a beautiful sight of fraternal collaboration. Slowly but surely, the structure was coming together. Moishy showed up later in the night after “daddy duty”, holding the roofing solution in his hands: an electric hedge-trimmer. The clock hit 2:00 AM and the brothers wouldn’t rest. After screwing in the paneling to the plywood and hanging some blue tarps to cover some extra wall space, we tossed branches and leaves on the rope woven along the top. After, with an extreme sense of accomplishment engulfing us, we hung up an AEPi flag and admired our creation with an eruption of high fives and bear hugs. As anticipated, some of it was a little crooked. Parts of the paneling left a couple cracks and some supporting beams were a little split from our repetitious drilling errors. But our hearts swelled with pride. In our eyes, it was perfect. That’s usually how things that we really care about end up: perfectly imperfect. After working hard enough, you come to appreciate every minor detail. Every bump and bruise is a further reminder of your perseverance to accomplish an unlikely goal, and the painful sacrifices it took to get to where you currently are. When challenges face us, it’s important to take it all one drill at a time. And when help is needed, hope there’s a brother or two you can count on to take a study break, grab some tools, and turn a daunting task into an unforgettable experience. Rabbi Moishy together with the builders of the Sukkah.